The Oscar cichlid is a popular cichlid among since it is an intelligent creature that will interact with the aquarist. With proper care and attention, an Oscar fish can turn into a true pet. It might even swim to your hand when you submerge the hand in water. An Oscar fish can learn to recognize its keeper. It won’t bark when you get home from work, but it can certainly wag its tail. Oscar cichlids will often perform quite a display when they want you to understand that they need to be fed. These little performances can include swimming up to the waters surface and repeatedly open and close its mouth, as if the fish is mimicking a nice dinner. Since Oscars are clever and curious they must be given some stimulation and should not be kept in barren aquariums. A bored Oscar fish can actually become stressed and more susceptible to illness. 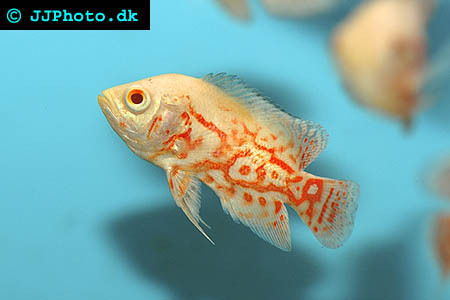 Oscar is the popular name for a cichlid known as Astronotus ocellatus. In addition to Oscar, it is also called Velvet cichlid and Marble cichlid. Astronotus ocellatus is not very sensitive and can be kept even by less experienced aquarists, but you must provide it with an aquarium that is large enough. A 100 gallon aquarium is considered a minimum. In the wild, it is not uncommon for an Oscar fish to grow larger than 30 centimeters (12 inches). When Oscars are kept in aquariums they rarely grow larger than 30 centimeters (12 inches). Oscars are large carnivores and they are known to be happy eaters even in captivity. Your Oscar will do best on a varied diet consisting of fish and insects. Feeder fish, crickets, worms, adult brine shrimp and krill are all suitable food types. Frogs and beef heart will also be appreciated. It is easy to train your Oscar fish into accepting prepared food, such as pellets and flakes. A high quality prepared food suitable for large cichlids is recommended. A prepared food can provide a good base, but you should not keep your Oscar fish on flakes or pellets alone. Supplementing prepared food with some of the food types described above is always advisable. Since small fish will be viewed as food, they are not suitable tank mates for your Oscar. Oscars are not very aggressive towards fish that is too large to be considered food, and you can house your Oscar with other large and non-aggressive fish species that like the same water conditions. Oscar cichlids are comparatively sturdy animals and will tolerate most water conditions as long as you avoid the extremes. If you want your Oscar to thrive, you should however strive to provide it with a pH between 6.5 and 7.0 and water that is soft or just barely hard. A water temperature in the 20-26 degrees Celsius (70-80 degrees Fahrenheit) range is recommended. The native home for Oscar cichlids are the River Amazon and its tributaries in Brazil and Paraguay, and you should always try to simulate that environment when you set up an aquarium for your Oscar fish.